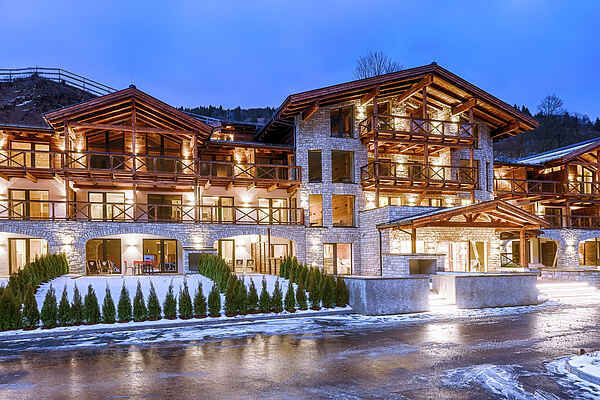 Luxurious apartment in well-known Saalbach, breakfast included These beautiful designer apartments are located on all floors of a luxury apartment complex built in 2015. The apartments are furnished in a modern design and have a warm ambience thanks to the use of natural materials. This designer apartment consists of a bedroom with a double bed, 2 wonderful bathrooms, 1 with a shower and toilet and 1 with a bathtub and toilet. The living room offers a spacious layout with a nice dining table and an open-plan designer kitchen. The sitting area with a sofa bed for 2 people is a great place to relax after a fun day in the mountains. The generously sized terrace/balcony can be reached directly from the living room. This is a wonderful place to enjoy the sunshine and the view of the surrounding mountain scenery. There is a parking garage for general use (additional fee) and you are free to use the complex's spa facilities, which include a fabulous sauna. Please note: The price includes a delicious daily breakfast. Dinner is also available for an extra charge. As a ski destination, Saalbach-Hinterglemm certainly needs no introduction. Almost nowhere else offers as many kilometres of ski runs in one place, from early December to mid-April. Whether cross-country skiing, tobogganing or of course the famed Apres Ski... you will find it all in Saalbach-Hinterglemm. In summer there is no shortage of options for hiking and other recreational offerings and most of the attractions in the state of Salzburg are within quick reach.